Il Monte Galala is located in Ain Sokhna Just 5 minutes away from Moveinpick hotel and 6K.m away from New Cairo, Embraced by the 23000 Feddens Galala City developed by Government. Real Estate Egypt, Ain Sokhna, Il Monte Galala Resort Sokhna, Villa Type 4B for Sale Il Monte Galal Ain Sokhna, Villa Land Area: 588m. Building Area: 275m. 2 floors: Ground+ Roof floor. Ground floor 175m. Roof Area: 100m. 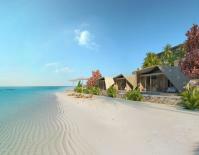 Also, the resort offer for its residence Commercial Area- Restaurant, cafes, commercial Shops. Ain Sokhna isn't just a sea resort , Il Monte Galala offers its clients the North Coast Life Style just one hour away from your home. altitude. Each district has been developed utilizing the unique natural beauty of the area and is characterized by specific design and architecture that reflects the atmosphere and key elements of the district. These areas have been seamlessly tied together by the distinctive urban stated modern architectural touches that run throughout IL Monte Galala-Sokhna"
Copyright © 2011-15 Realestateegypt.com.Developed and Hosted by Gates2Host web & SEO services.